Today's post is by Amy Herzog, associate professor of media studies at Queens College, City University of New York. She is author of Dreams of Difference, Songs of the Same: The Musical Moment in Film. In a sequence from Christopher Nolan’s film Inception (2010), we are introduced to the mechanics of shared dreaming alongside the young architect, Ariadne (Ellen Page), as she is being recruited by master dream manipulator, Dom Cobb (Leonardo DiCaprio). While sitting at an outdoor Paris café, Dom reveals to Ariadne that they are in fact communing in a dream space of her own subconscious design. As the realization washes over Ariadne, the surrounding streets begin to tremble and fracture. Building facades burst like concrete and glass puffs of popcorn. The earth heaves with a low-end groan, and the air fills with the detritus of what had moments ago been the weighty objects of urban life: produce crates, cobblestones, shards of furniture. Regardless of one’s position on the critical value of the film, it is difficult to deny the centrality of music to Inception’s aesthetic and thematic project. The soundscape at large is bombastic, washing over the action in a densely layered soup of real and synthetic elements. On the level of narrative, the characters make poignant use of Edith Piaf’s “Non, Je Ne Regrette Rien” as a cue throughout the film. Piaf’s song serves as a sonic guidepost to carry the dream-infiltrating team through the subterranean layers of consciousness into which they have submerged. Though the visuals of the film are indeed intensely rendered, the overall spectacle is a true audiovisual fusion. Much like a dreamer’s reverie, our affective responses to this mix supersede logic or reason. Which is not to say affect is the only level on which Inception resonates. While critics have tended to pit intellect versus emotion in the film (reading it as either a compelling drama about lost love or an intricate and meaningless logical exercise), I would argue that the film circles ambiguously around these poles. Critics on both sides, I suspect, are responding to the film’s refusal to satisfyingly root itself either in a plausible emotional drama or within in a philosophical construct that holds water once the rush of sounds and images has faded away. Yet this refusal may be the film’s most interesting move, one that seems linked to its larger commentary on the machinations of cinema as an art form. Cinema, like the dream, toes a self-conscious line between reality and fantasy, narrative structure and spectacle, reason and feeling. Inception invites this comparison between film and dream most pleasurably in a rush of cinematic allusions. These nods are at times direct visual references, such as Ellen Page’s styling in one dream world as a mirror image of Kim Novak’s Madeleine from Vertigo (Hitchcock, 1958) (with every detail rendered, from the twist in her hair to the folds of the scarf beneath her fitted gray wool suit). At other times, the connections may be more oblique, but there are clear resonances with films such as 2001: A Space Odyssey (Kubrick, 1968), Blade Runner (Scott, 1982), and The Matrix (Wachowski, 1999) — be they visual echoes, or hauntingly similar spaces or tones. Yet the tie to Vertigo strikes me as the most revealing. In both films we follow our protagonist/investigator down a rabbit hole in which reality is revealed to be anything but transparent. We, alongside our on-screen avatar, are seduced by an image of love that unravels into pure fabrication. But the emotional impact of that memory is not diminished by this revelation; rather, it is the pillars of the “real” world that begin to crumble and quake. The ground shifts, and we are left in a maddening and extremely disconcerting realm between knowledge and feeling. The question of music remains key here. Vertigo, too, is driven by a score that refuses to play a subservient role to the image. Neither Bernard Hermann’s score for Vertigo nor Zimmer’s for Inception, for me, tip into the realm of the “musical moment”—those instances where song wells up to dictate the rhythm and flow of images, no longer moored to narrative reality. 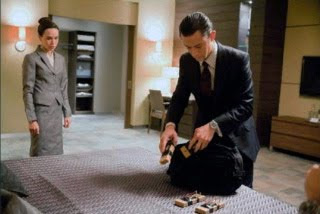 The music in both Vertigo and Inception never assumes complete, embodied control in this sense, but seems to provide simultaneous commentary on both emotional and symbolic registers. The themes circle round in cascading circles of notes or in overlapping waves of orchestration. We are lured in, but are left, in the end, purposefully adrift rather than immersed. Multilayered allusions are further entrenched within Inception’s soundtrack. Zimmer, in fact, constructed his score on a heavily manipulated fragment from “Non, Je Ne Regrette Rien.” Extracting an isolated beat from the song, Zimmer’s team enhanced it with “isolated brass stabs,” and built the rhythms of the score around “subdivisions and multiplications of the tempo of the Edith Piaf track” (Hans Zimmer, quoted in Dave Itzkoff, “A Film’s Mysteries Include a Tease to Édith Piaf,” New York Times, 1 August 2010). Without prior knowledge of this borrowing, the connection between song and score, for most listeners, would not be fully apparent. Given the particularly forward nature of Zimmer’s composition, however, the resonance lodges (or is pushed) into our subconscious. It is a carefully orchestrated technical feat, but one that builds on the very real, lingering power Piaf’s song retains (both within and beyond the narrative world of the film). For all the discussion of Inception, technologically, as the ultimate immersive experience, I find it interesting that Nolan’s script and visualization and Zimmer’s score seem adept at refusing us the satisfaction of full and easy submersion. While I would stop short of making comparisons between Nolan and filmmakers such as Hitchcock and Kubrick, Inception appears to make explicit reference to films like Vertigo and 2001 that make brilliant use of spectacle laden labyrinths to reveal a destabilizing image of our lived reality. As in those earlier films, we are constantly slipping in and out of self-conscious awareness in Inception, tipping between the layers of dreams the onscreen architects weave, and momentary realizations of our own status as movie viewers. The numerous intertextual references, the relentless push of the score, and the familiarity of the rich ensemble cast in Inception guarantee a degree of self-consciousness. I’d see this less as a shortcoming than as a deeply engaging exploration of the pleasures and pitfalls of collective dreaming. Amy Herzog can be reached at amy.herzog@qc.cuny.edu. Learn more about her book, Dreams of Difference, Songs of the Same: The Musical Moment in Film. Photos used in this post can be found at The Movie Mash and Screen Crave.